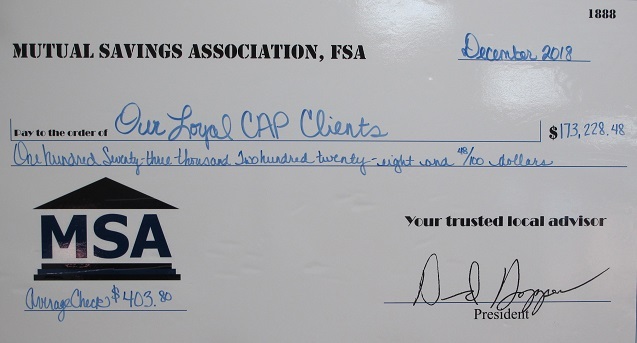 CAP is Mutual Savings’ Client Appreciation Program. It is a loyalty rewards program for clients who have multiple account relationships with us. When we did our research and asked clients what they wanted most in a loyalty rewards program, the overwhelming majority said “cash back”; not toasters, blenders, or bus trips. So we structured CAP to reward you with what you value most. Qualify for membership and receive cash incentives for certain kinds of new and existing relationships with us. CAP members can earn hundreds of dollars in incentives each year. There are many other benefits as well. These include a member newsletter, special meetings, scholarships for family members, a special high-yielding account for CAP members only, special CD rates, and other promotions throughout the year. And…we just made it easier to qualify for membership. Individuals and businesses are both eligible for membership. It only takes a few minutes to complete the application. Stop by your nearest Mutual Savings office and let a representative review the program with you and give you examples of how to begin earning cash back for the business you do with us. In 2017 we paid out $173,228.48 to our CAP member’s! The average check was $403. Talk to a personal banker today to make sure you get yours this year.